Craftster Community > CLOTHING > Clothing: Completed Projects: Reconstructed (Moderator: meleriffic) > EDIT: Cute sweater dress. Now with tutorial. 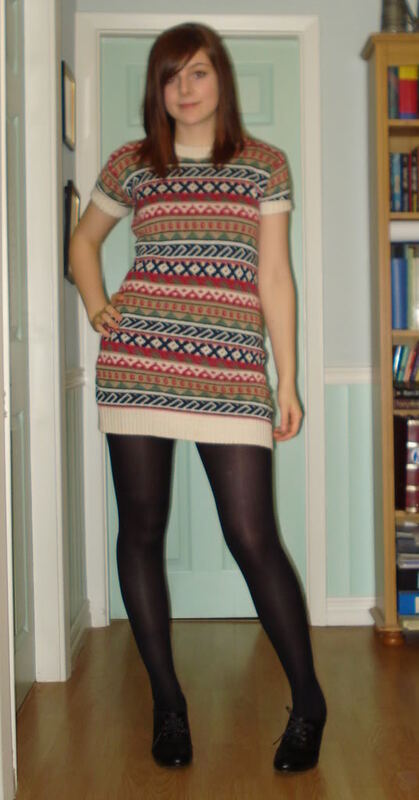 EDIT: Cute sweater dress. Now with tutorial. This started life as a men's XL jumper I found in a charity shop for £4. I forgot to take before pictures, but basically it was just huuge with massively long sleeves. It's not quite as short as it looks in the picture. 2. Carefully take off the jumper, trying to not a) stab yourself, or b)lose any of the pins. 3. Sew along your lines of pins. I did three lines of stitching to make it extra secure. 6. With the main body of the jumper inside out, put the piece of sleeve you have cut right way around inside the sleeve hole. You should have right sides together inside the jumper. Pin/tack the sleeve in one inch from the cut edge. This should make the new sleeve seam match the side seams. Sew in with your machine. 7. Turn the jumper the right way out. Place cuffs inside the sleeves with the right side facing out. (the right side of the cuff should be facing the inside of the sleeve). Pin/tack an inch away from the cut edge, then sew securely (or less than an inch if your cuffs are narrow. Pull the cuff out of the sleeve and fold it over so the right side is folded up over the sleeve. Use small stitches to keep the cuff in place if you want. 8. Finish all the seams for extra security. I'm planning on either binding them or using my neighbour's overlocker, but I've found that folding the cut edges of a seam in, then zigzagging these folded pieces together stops knitted fabrics from fraying. Try and not pull the fabric about too much as this stretches it out of shape easily and cause fraying. By leaving an inch seam allowance you should have a bit of room for error if it does fray though. I hope other people have a go at this, it really isn't as difficult as I've made it out to sound! I'd love to see pictures of your take on this! I want it. Id wear it with thick tights and my battered old uggs for added comfort. Its gorgeous. Youve done a fab job! it's adorable! It fits you so well. Plight of the Living Dead; A blog. If I were not the Woman Who Just Had Two Babies in Less Than Two Years I would so wear that, uh, everywhere, and leave a trail of smitten dudes after me. Cute!!! And it looks great on you! All that glitters is fabulous. luvverly. did you felt it or reseam it? I love it! Beautiful work.